Many tourists pay attention primarily to the sights of the city on the Neva, which are its characters: Alexander Column, “The Bronze Horseman”, sphinxes on the University Embankment, and others. 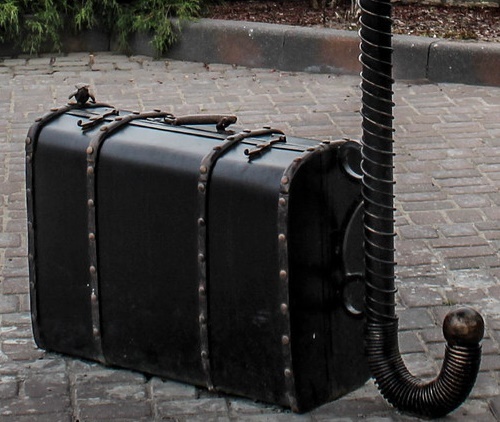 However, sometimes you want to see something little-known, but interesting. 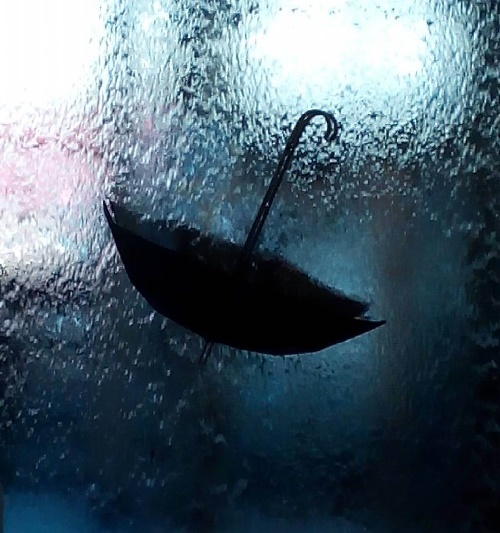 Rain is one of the visiting cards of the city, like the famous London fog. In St. Petersburg, it is a half-fog hanging between heaven and earth all the autumn-spring period. But it creates a unique atmosphere of the city. The city of rains. 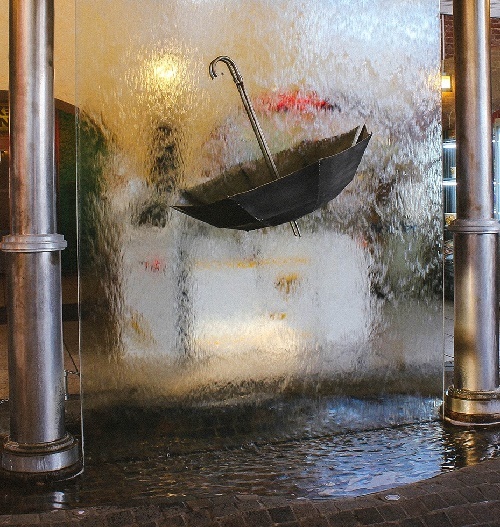 Monument to St. Petersburg rain appeared in the shopping center “Izmailovo Gostiny Dvor” six years ago. In the original monument there is nothing superfluous – a huge inverted umbrella of gray color turned upside down. 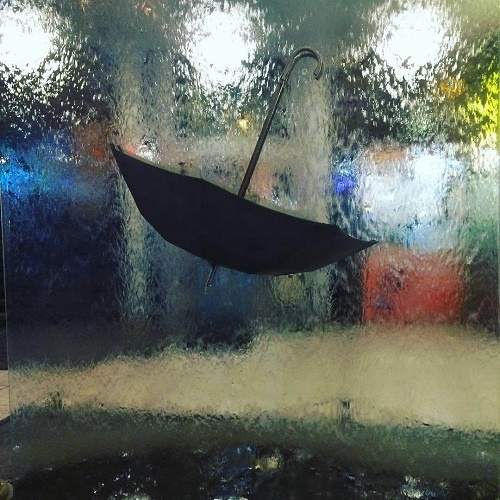 It is cut exactly in the middle into two parts by the glass, which symbolizes the rain – on it, drop by drop, is constantly dripping water. The bottom of the monument resembles a curved stone pavement, and in its recesses water has accumulated. This puddle exactly reproduces the autumn and spring urban landscape. Modern sculptural composition is actually a fountain, as the water jets slide on the glass permanently. Around the monument, even appeared a tradition – tourists and residents of the city ask it to bring fine weather. And in the long winter days, it becomes a reminder of the most common weather in St. Petersburg. 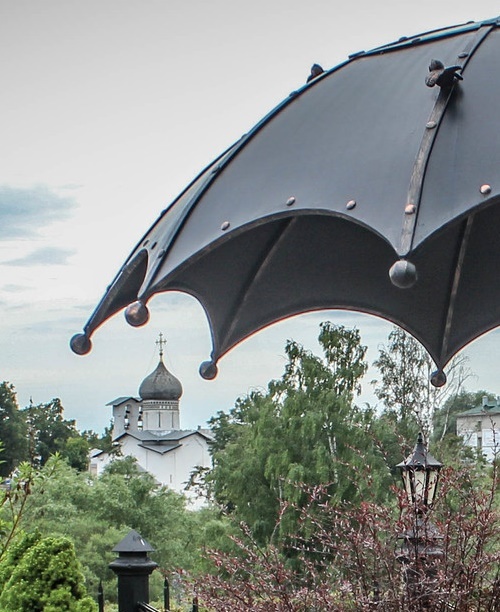 One more monument to umbrella appeared in Pskov, in the parking lot of the hotel “Old Estate Hotel & SPA”, in front of the Church of the Epiphany. 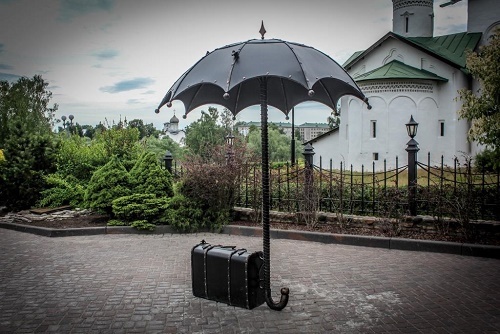 The sculptural composition consists of a suitcase standing on the ground, and a huge umbrella, under which can easily accommodate several people and on which sits a sparrow.